Heat one cup of water to near boiling and slowly add 5/8 cup of corn meal while stirring on the stove. Continue stirring for a minute or two until well blended. Bring to a boil and remove from heat, then set the sauce pan aside while the corn meal absorbs the water. Beat two eggs in a low, flat bowl and thoroughly mash in one-half cup of baked pumpkin. (Miniature pumpkins are the perfect size. I bake mine in a microwave for three minutes, allow the heat to distribute, then bake for another three minutes. Poke a hole in the pumpkin first so it does not explode.) Blend in three-quarters of a cup of half-and-half. Add three tablespoons of agave nectar (look for agave next to the honey in your grocer's bulk section). Then blend in one tablespoon of molasses and one-half teaspoon of vanilla extract. Melt three tablespoons of butter or butter substitute and add to the egg/pumpkin mix. Blend these thoroughly by whipping with a fork or wisk. Sift and fully combine one and one-third cups of whole wheat flour with one teaspoon of cinnamon, one teaspoon of baking soda, and a pinch of salt. In a large mixing bowl, blend the corn meal mix and the egg/pumpkin mix, then sift in the flour while stirring. Spoon the mixture into a hot, oiled cast iron skillet or griddle to make four inch pancakes. Flip when the bubbles start to burst and watch them rise. Serve topped with a sweet fruit puree. I recommend yellow plum jam. 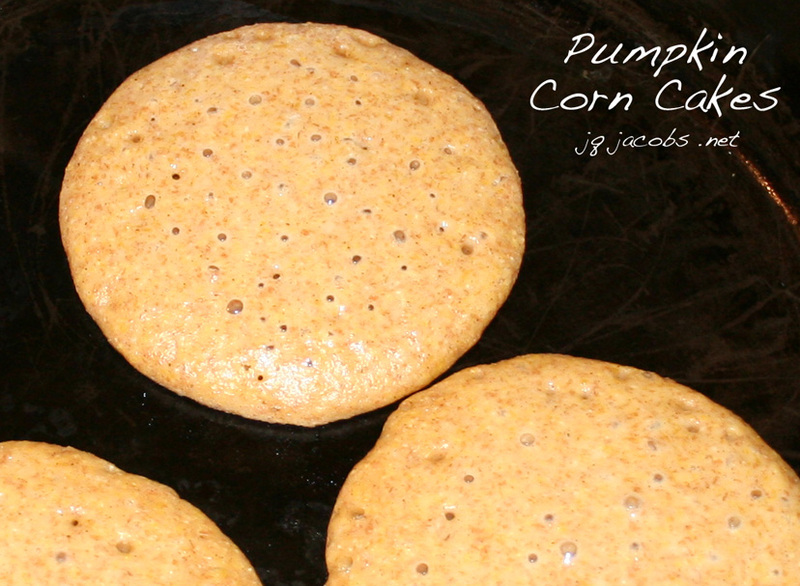 I lost my old pumpkin corn cake recipe, so I improvised this version. I like it much better and the first test recipe above was quite satisfactory to my taste. Pumpkin pie lovers might add more pumpkin and seasonings, such as nutmeg. For my next batch, I might use a little less molasses so the pumpkin flavor is more dominant. Enjoy!